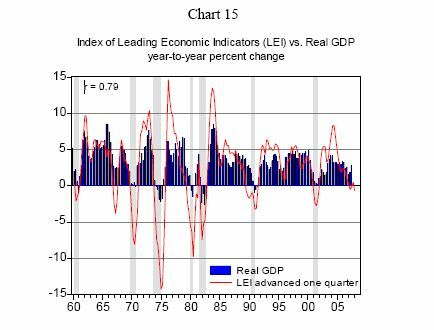 The Index of Leading Economic Indicators [LEI] fell 0.2% in December after a similar decline in November... the LEI has now declined in four out of last six months... The quarterly average of the LEI is down 0.6% from a year ago. Historically, negative year-to-year changes in the quarterly LEI are associated with recessions with the exception of the drop in 1967 when the economy was weak. Larger declines will be necessary to confirm that a recession is underway. However, the fact that the LEI has now declined in two out of last three quarters on a year-to-year basis is a strong signal that should be watched (see chart below). The ratio of Coincident to Lagging Index declined to the lowest level in the current cycle. The current ratio (0.9589) is lower than the ratios reported for March 2001 (0.983) and July 1990 (0.9867) when the last two recessions commenced ... [all of which sends] a strong signal that economic conditions are significantly weak.